I love Windows Live Writer to death. I don’t think I can say that about any other Microsoft product. It serves my blogging needs so perfectly! However, I use a couple of Linux desktops at home and work and I have wanted to use Windows Live Writer on Ubuntu and SLES Desktop. I have tried to run it on Wine but it doesn’t work the same. So, instead I set out to look for a Windows Live Writer linux alternative. I think I found one that comes pretty close. The ability to store drafts locally and online is also important so I can work quickly off of saved drafts. Blogilo satisfies all these blogging software needs. Blogilo works just like Windows Live Writer in setting up a new blog. You can easily pick a Blogger, WordPress.com or self-hosted WordPress, MetaWeblog or MovableType as the blog service. You can create new blog posts, fetch recent posts from the blog for editing, save locally, save online draft, etc. The software also offers spell check, url caching and post preview. 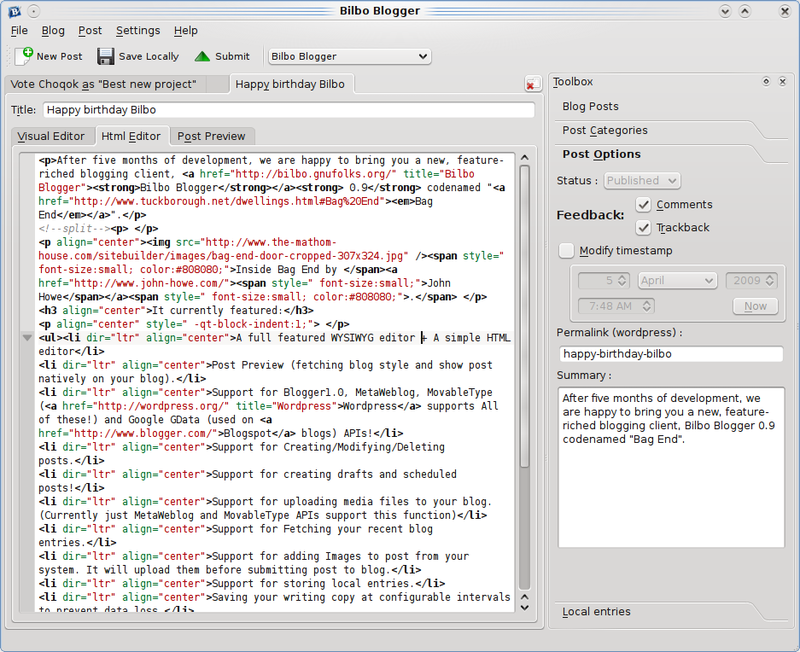 It has a visual editor as well as a HTML editor and you can also preview blog post in a browser before publishing. Like any other WLW alternative, Blogilo also has a few shortcomings. I wish I can find a great cross-platform blogging client that works the same across computers.